MATTESON, Orsamus B., representative, was born in Verona, N.Y., in 1805. He attended public schools, studied law in the office of Greene C. Bronson and became a leading lawyer in Utica. He was an early disciple of the Freesoil party; was the first city attorney of Utica ; a commissioner of the supreme court of New York ; and was a Free-soil and Republican representative in the 31st, 33d, 34th and 35th congresses, 1849-51 and 1853-59. He became conspicuous by being charged with declaring that a large number of the representatives in congress were purchasable, and a resolution to expel him failed to pass. He died in Utica, N.Y., Dec. 22, 1889. Orsamus B. Matteson was born August 28, 1805, in Vernon. He died in Utica, December 22, 1889. He received a common school education, and studied law with Green C. Bronson; was admitted to the bar in 1830, and was elected city attorney of Utica the same year. In 1846 he was nominated for member of congress, but was defeated by Timothy Jenkins. He was a candidate again in 1848 and was elected, but was defeated in 1850. Afterward he was elected in 1852-54 and 1856. He was second to no man in influence in the house of representatives, and took strong ground against slavery. After his retirement from congress he devoted much time to politics, and was a potent factor in the Whig and Republican parties. At one time the firm of Matteson & Doolittle did, perhaps, the most lucrative law business that was ever obtained in the city of Utica. Mr. Matteson was a great business man rather than a great lawyer. At one time he was a very wealthy man, but before he died had lost his entire fortune through unfortunate endorsements. He died in Utica, on the 22nd day of December, 1887. ORSAMUS B. MATTESON was born in a log house August 28, 1805, in the town of Verona, in this county, and died in Utica' December 22, 1889. His father was Silas Matteson, and his mother was Hannah Cogswell. When he was nineteen years of age he entered the office of Green C. Branson and Samuel Beardsley as a lawi student. He was admitted to the bar in 1830. One of his first clients was the late Alexander B. Johnson of Utica, who at the time was perhaps the foremost business man of the city. Mr. Matteson was elected City Attorney in 1830. He became a partner with "William J. Bacon, and afterwards with P. Sheldon Root and the late Charles H. Doolittle, and afterwards with J. Wyman Jones; also G. H- Congor and Joseph Benedict. He was a Supreme Court Commissioner early in life. His ability was such, as a business man, that he always had, while he gave his time to law practice, a very large and lucrative business. In 1846 he was first nominated for Representative in Congress, but was defeated by Honorable Timothy Jenkins. He again was a candidate for the same office against Mr. Jenkins in 1848 and was elected, but was defeated in 1850. He was again elected and reelected in 1852, '54 and 56. While in Congress he held a very prominent position. His influence was second to no man in the House of Representatives. He was an intimate friend of Benjamin Wade of Ohio, John P. Hale of New Hampshire, Joseph R. Giddings of Ohio, and Thaddeus Stevens of Pennsylvania. He took a prominent part in the agitation against slavery. In this his very life seemed to be enlisted. H5s hatred of slavery was so great that it over-ruled him completely in his political actions. He seemed to have one great thought, and that was to do all in his power to eliminate this curse from the land. Actuated by revenge certain persons undertook his political destruction. He had written a letter to William C. Johnson of Utica, which it was claimed compromised him to such an extent that charges were preferred against him in the House of Representatives. This occurred on July 15th, 1856. The substance of the letter was that a money consideration was necessary to carry a certain measure through Congress. He also intimated that there were a sufficient number of congressmen that could be influenced by money to carry the measure. This letter it was claimed was stolen from the office of Mr. Johnson. An investigation in Congress was ordered, and on February 22, 1857, a committee reported in favor of his expulsion. This report was accompanied by three resolutions. The first charged that he had favored the use of money to influence legislation; the second that he had charged that there were members who had associated together and agreed not to vote for certain legislation except they were paid for it. The third resolution recommended expulsion. This investigation was made substantially without giving Mr. Matteson a fair hearing, and he saw that it was useless to defend himself against a prejudiced committee and a house in the state of mind that it was then in, because of his intimation that many of them were corrupt. He therefore resigned his seat in Congress. The first two resolutions were adopted by the House, but the third was never voted upon. 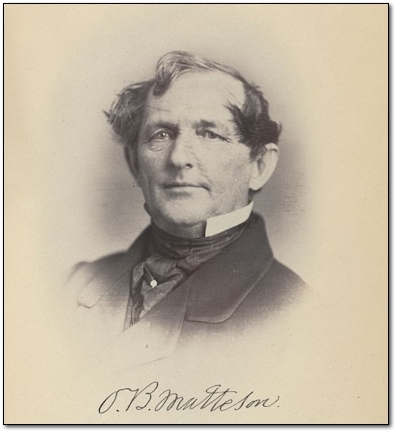 Mr. Matteson after his retirement from Congress gave much time to politics, and was for many years a potent factor in the Whig and Republican parties. It was he who led the fight against the first nomination of Roscoe Conkling to the position of Representative in Congress, and it is notable that about this time he wrote a circular letter upon Mr. Conkling in which he prophesied that Mr. Conkling would disrupt the Republican party. Strange to say this prophecy was fulfilled in that the influence of Mr. Conkling was the means of the defeat of James G. Elaine to the presidency in 1884. Mr. Matteson was tendered the nomination of mayor of the city of Utica in 1865, but he declined. This is the only time that he was nominated for office or tendered the nomination for any political position after his resignation from the House of Representatives. He married Augusta Hurlburt, daughter of Kellogg Hurlburt, May 17, 1830. Although he had a brilliant son, the late Henry C. Matteson, Mr. Matteson left no descendants except two granddaughters, and the name of his branch of the family by his death became extinct. Mr. Matteson was for all in all the ablest business man who ever appeared at the bar of this county. At one time he had accummulated a large fortune, but he became involved by the endorsement of his friends' paper, and lost it. He died, virtually dependent upon the bounty of his friends. Orsamus B. Matteson, of Utica, N. Y., died yesterday, aged eighty-four years. He was the first City Attorney of Utica, Commissioner of the Supreme Court for a number of years, and Representative in Congress to the Thirty-first, Thirty-third, Thirty-fourth and Thirty-fifth Congresses. He was born in a log house in Verona, Oneida county. He was of a family of eleven children. He only received a common school education. At the age of nineteen he was a fellow student in a law office with the late Governor Horatio Seymour. He had held law partnerships with Judges William J. Bacon, P. Sheldon Root and Charles H. Doolittle. He was early prominent in the free soil wing of the whig party and thus became a close friend of William H. Seward. He was also intimate with such free soil leaders as Senators Wade, John P. Hale, J. K. Giddings and Thaddeus Stevens. He also had close relations until their death with Thurlow Weed and Horace Greeley. When Mr. Matteson was in Congress, in 1856-57, he was charged with declaring that a large number of members of Congress were purchasable. The affair caused great excitement in Congress and throughout the country. A resolution ordering his expulsion was offered in the House. but after a long and bitter debate it was finally tabled. Before it could be called up again Mr. Matteson resigned his seat. About this time a number of Congressmen and other prominent persons in the National Hotel in Washington were poisoned. It was believed to be a pro-slavery plot to murder President-elect Buchanan and seat Vice President Breckinridge. Mr. Matteson was one of those poisoned and came very near dying. In fact, his health was affected permanently. During the later years of his life Mr. Matteson engaged in several disastrous business enterprises and died comparatively poor. Mr. Matteson married Miss Mary Hurlburt, of this city, in 1830. She survives him. Their children were Henry Clay,deceased, and a daughter, widow of Colonel George Pomeroy, of this city. Two brothers and two sisters also survive. |     |  +--- 8-John Wood,d.?? ?